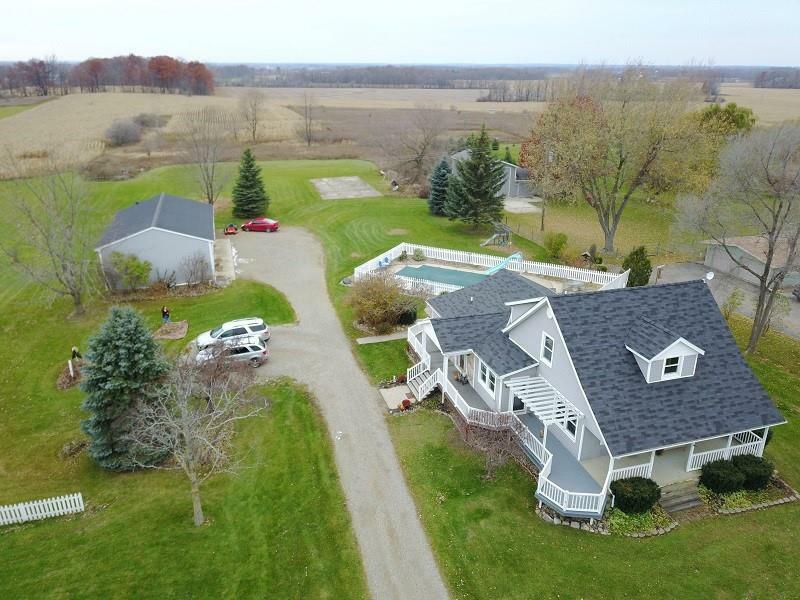 Lovingly maintained and remodeled farmhouse on 10 acres. This home is move in ready w/ a total of 5 bedrooms and 3.5 baths. Heated saltwater inground pool w/ diving board and slide(3-8.5 ft deep). Cement fenced patio around pool includes bonfire area, patio, and lounge area. Composite decking overlooking rear yard and pool area great for BBQ’s. Also wrap around porches for the country life. Large 30x60 pole barn with 12ft doors and lean too storage. Store your RV, boat & other toys. Has insulated workshop. Original farmhouse was total remodeled with all new down to studs in 1992. Great room addition is just awesome with vaulted ceilings, lots of windows for natural light, stacked stone wall w/ gas fireplace and hwd flrs. Full basement(10') under addition is finished with 2 bedrooms with egress windows, play area and full bath. Spacious granite kitchen w/ island. Paved rd & nat gas. Downtown North Branch and schools are less than 5 minutes away. What a great place to call home.